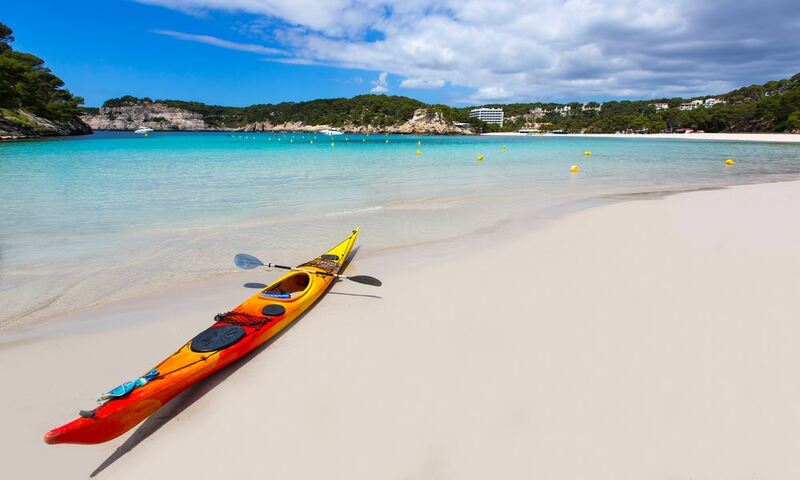 Kayaking is the ideal opportunity to explore the most beautiful but otherwise impenetrable bays of Menorca, to sail on harsh seas and to camp on the magnificent deserted beach. On the map of Menorca you can see impressively 99 beaches that struggle for space along the 216 kilometres of seacoast. Almost half of them have no road links, and most of them are only accessible by sea. The Menorcan Tourist Association runs self-guided kayaking tours around the entire island. That sounds like a phantastic travel experience, doesn't it? You can expect an exciting tour with a breathtaking panoramic view of the nature around the promontory of Favaritx. You can admire the virgin beaches of Sa Torreta and the island of Colom and swim in the crystal clear sea in the cave "Des Colomar", where the unique marine beds full of seagrass meadows lie. An ideal adventure for the whole family!